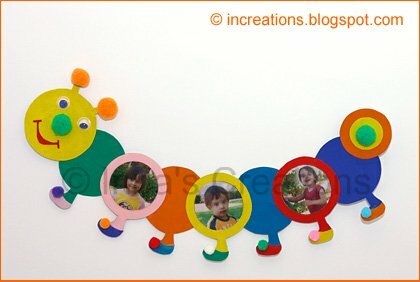 This cute caterpillar picture frame was really easy to make, and my kids enjoyed both the process and the result. You will need cardboard, coloured paper (or paints), scissors, adhesive and photographs. There are also a lot of ways to decorate your frame: glitter, beads, collage or whatever you want. We just glued pom-poms and wiggly eyes. I hope the making itself is quite obvious. I'll mention only that we used a circle-and-leg template for caterpillar sections.